World Book Night is an annual celebration dedicated to spreading the love of reading, person to person. Each year on April 23, tens of thousands of people go out into their communities and give half a million free World Book Night paperbacks to light and non-readers. 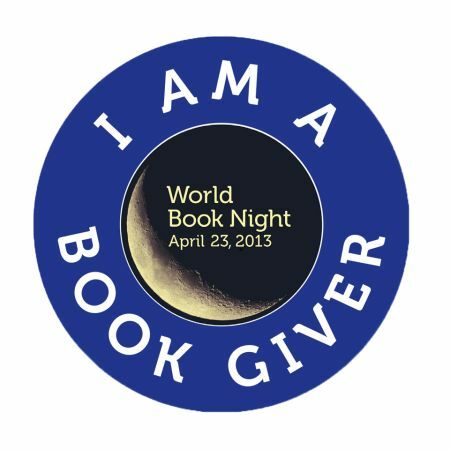 In 2012, World Book Night was celebrated in the U.S., the UK, Ireland, and Germany. I am lucky to be chosen to be a book "giver" for 2013. 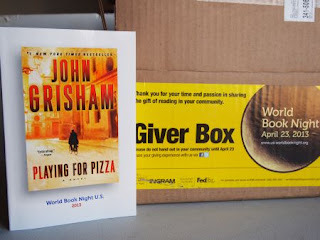 A few months ago, WBN asked for input on what books to give away this year. I read several of the books, and chose "Playing for Pizza" by John Grisham. I mailed my books to My Little Sailor on the USS George Washington -- after all, a United States Ship is technically US soil! I chose "Playing for Pizza" because I thought this light read would appeal to young Sailors who might not have the "reading habit." I hope during their summer "cruise," they will enjoy reading this book and maybe come back for more. If you'd like to get involved, go here to sign up for the World Book Night newsletter. And keep on reading! That's a very good choice and particularly for the age range. My Rainbow, brownie and guide units give book vouchers to the children to be a exchanged for a book of their choice from a range. This really is a wonderful idea. I wish I had known about it sooner. I had planned to participate this year until I realized we would be traveling. Hopefully I can do it next year.